CAUTION Snapback is extremely dangerous and has caused severe injuries and death. The utmost caution must be observed when working with or around all synthetic lines. WIRE ROPE The basic unit of wire rope construction is the individual wire, which is made of steel or other metal and comes in various sizes. These wires are laid together to form strands. The number of wires in a strand varies according to the purpose of the rope. A number of strands are laid together to form the wire rope itself. Wire rope is designated by the number of strands per rope and the number of wires per strand. For example, a 6 by 19 rope will have 6 strands with 19 wires per strand. It may have the same outside diameter as a 6 by 37 wire rope, which will have 6 strands with 37 wires of much smaller size per strand. The more wires per strand, the more flexible the rope. Rope with fewer and larger wires per strand is more resistant to external abrasion. The strands of the wire rope are laid up around a central core, which may be only a single wire, a single strand of wire, or hemp. A hemp core contributes flexibility, cushions the strands as the wire rope contracts under strain, and holds a portion of lubricant for continuous lubrication. A wire core is stronger than hemp and can be used where conditions, such as high temperatures, would damage a hemp core. WHIPPINGS Whippings are bindings on the ends of rope that keep the rope from unlaying. On line, whippings are made with cord, such as sail twine or with marline. The ends of all line must be whipped because of the frequent need for passing the ends through rings and pad eyes and for reeving them through blocks. Unlaid and frayed ends of line are unsightly and unseamanlike and waste many feet of line. Knots or backsplices in the end of a line are not allowed, nor are friction tape or wire whippings. Knots and backsplices will jam in a block; friction tape will not hold for long; and wire may tear a line-handlers hands. The most secure whipping is made with the aid of a sail needle and palm. However, an excellent whipping can be made without a needle if the procedure shown in figure 7-14 is followed. First, lay one end of the whipping along the line, bind it down with a couple of turns, and snug up the edges. Then lay the other end on in an opposite direction with the body portion of the whipping, continuing with several more turns from the bight of the whipping. The whipping length should be about equal to the diameter of the line being whipped. 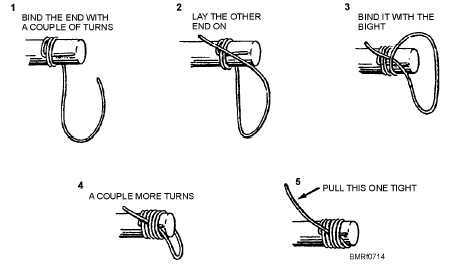 Snug up the edges and cut off the twine close to the line. This type of whipping is a temporary one. If the line is to 7-14 Student Notes: Figure 7-14.Plain whipping a line.